What initials would you like on your ring holder? 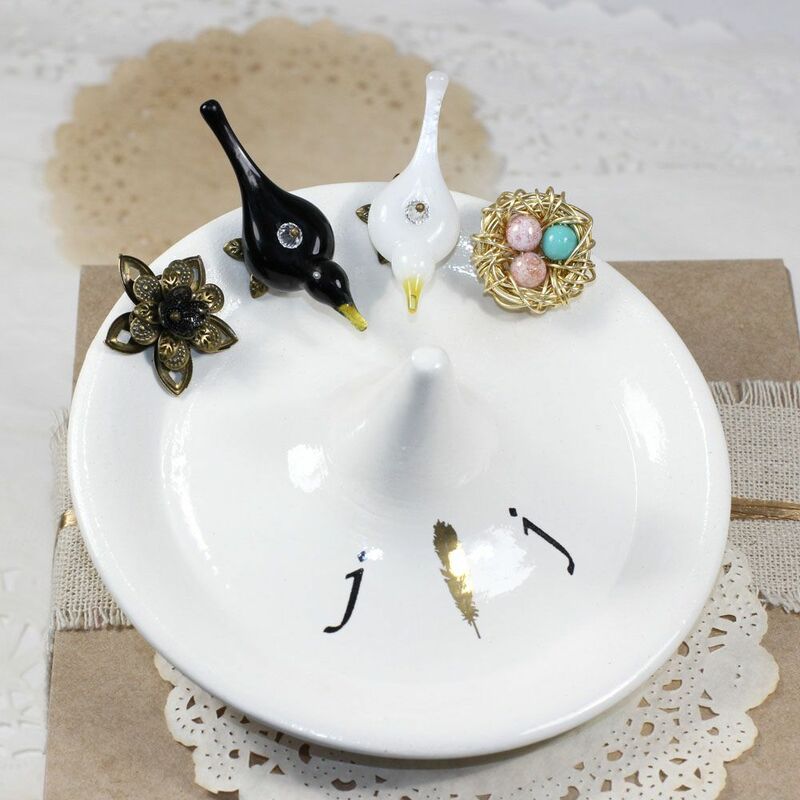 A special gift for a special couple and their family, my Bride and Groom bird family ring holders are sweet, elegant and individually personalized, just for you. 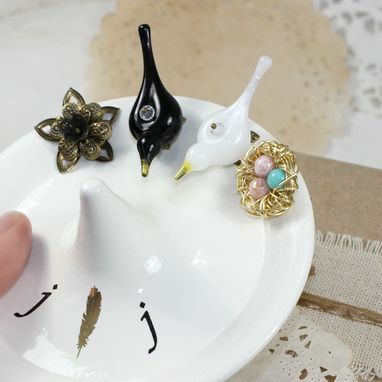 I sculpt each bird from molten glass, making each one a tiny work of art! 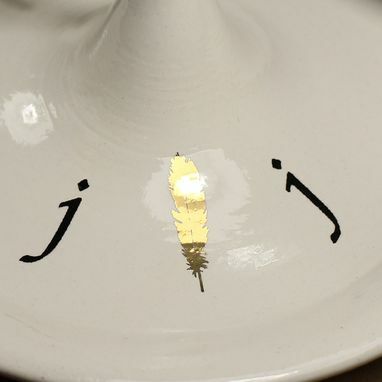 The love bird's lower case initials, & a 22K gold feather, are fired into the glaze in the bottom of the dish. The designs are created using extremely fine glass enamel powders, so the colors are rich and true. Because they are made from glass, they fire right into the glaze, creating a stunning permanent finish that won't scratch or fade. 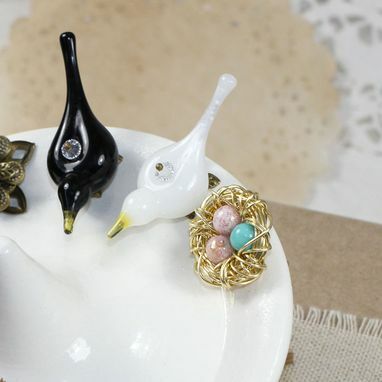 Personalize the gold wire nest to the right of the bird pair to represent your family by choosing eggs that match you! Choose from 1 to 4 eggs in white, turquoise, light blue or pink, in any combination you desire. 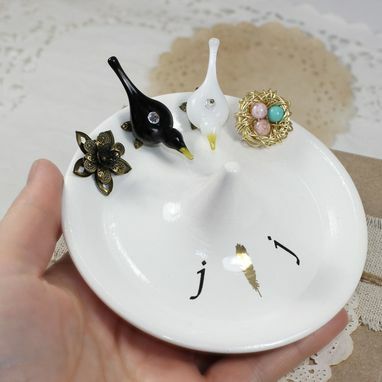 This ring holder features black and white love birds perched on the rim. 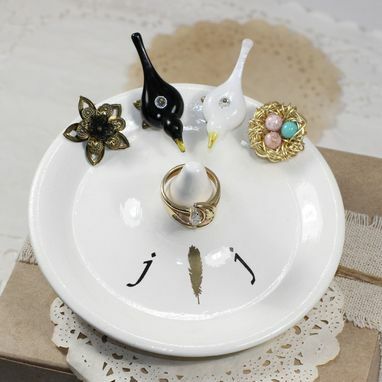 The ring holder is created from white ceramic clay and glazed glossy white. A unique antique bronze filigree style flower ornaments the love bird pair on the left. This personalized ring holder holds special rings in style!